Sunday, January 13th. Slightly jet lagged, but I was able to sleep intermittently until 4:45am, Hawaii time. 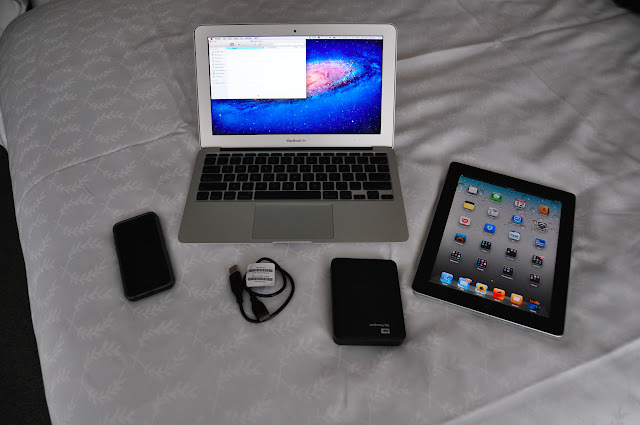 My computer gear on this trip, pictured below, comprises an 11" MacBook Air laptop, iPhone5, iPad2, and a portable 2TB drive. Taking the tiny MacBook Air rather than my normal bulky 15.4" MacBook pro laptop makes a big difference. Not as comfortable to type, but much much lighter. In encountered one unanticipated problem though. As I mentioned in the previous post, I was upgraded to a better room in the Ainahau tower, where I discovered they have no wireless Internet service, just wired ethernet (and the MacBook Air doesn't have an integrated ethernet port). I can't remember the last hotel (in this country) where I didn't have wireless, so it didn't even occur to me to bring the Air's separate USB ethernet dongle. Luckily, my colleague Richard Machida had one with him which he loaned to me a day later. I took the 7:30am Joint Techs shuttle bus to the University of Hawaii campus. I sat next to Kevin Mayeshiro, from the University of California at Davis - who already knew who I was. It turns out my colleague Colleen Szymanik has spoken to him as a reference for Brocade Networks - Penn is evaluating Brocade as a candidate vendor for the next refresh of our campus core routers. 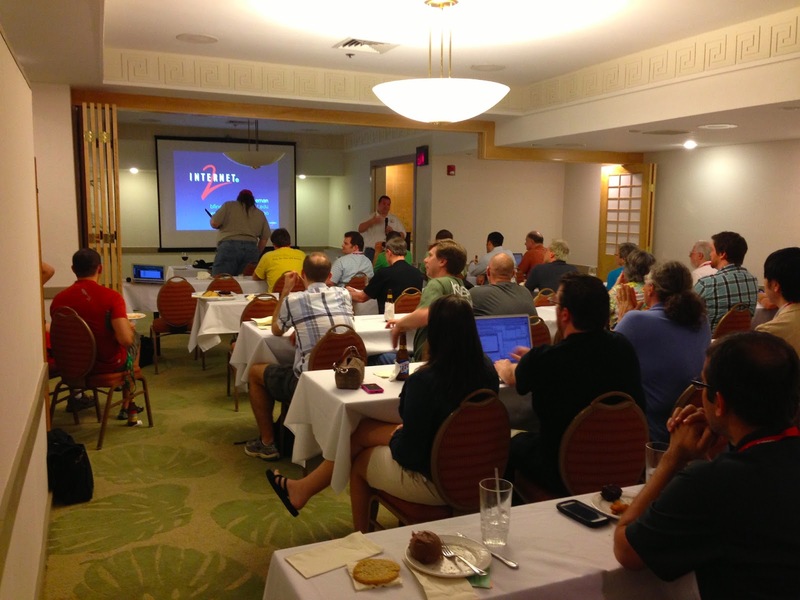 Kevin grew up in Hawaii, so it was good to chat with someone with extensive local knowledge of our venue. The conference venue is the University of Hawaii's "East West Center", pictured below with the line of folks waiting for registration/bag pickup. Sunday is customarily a day occupied by tutorial sessions. I attended sessions on BGP Rover, RPKI, and DNSSEC. Below: Dan Massey form Colorado State University talks about the BGP ROVER route origin verification system. 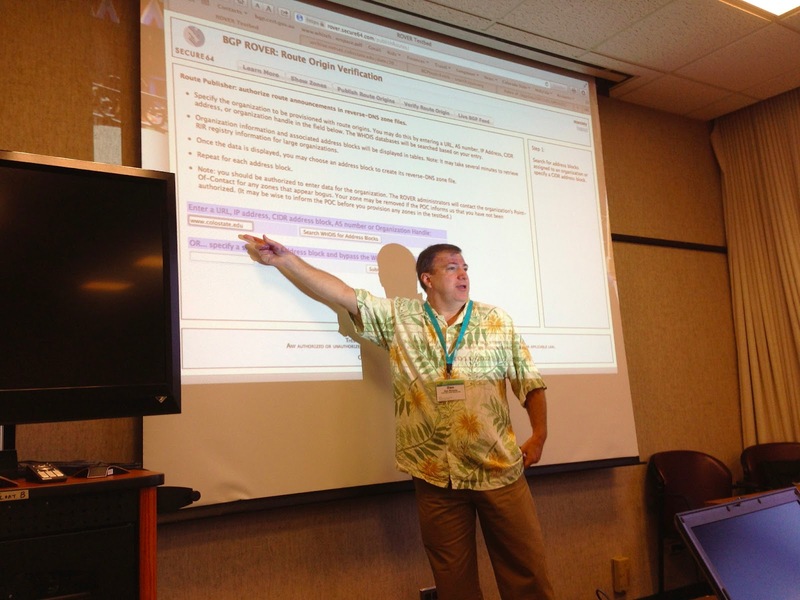 Below: RPKI (Resource PKI) tutorial/demo session run by Randy Bush of IIJ. 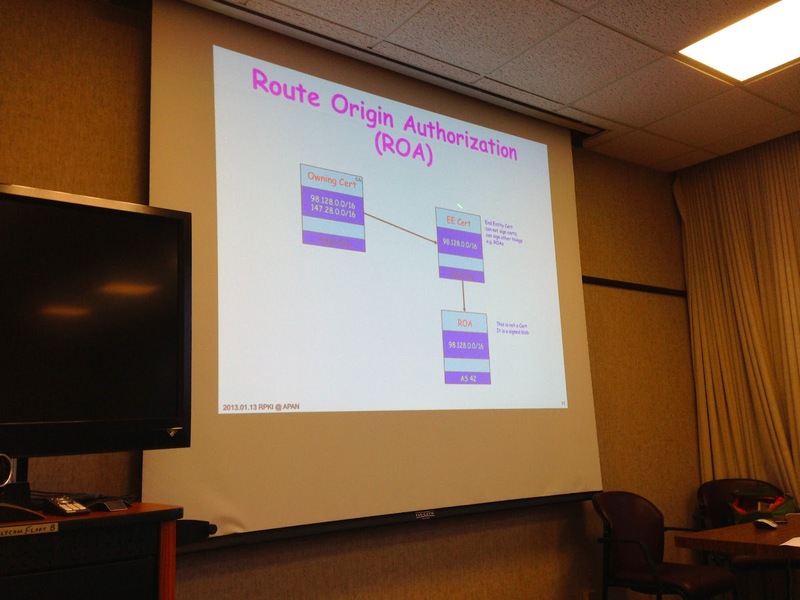 Below: DNSSEC tutorial by Michael Sinatra of ESnet. 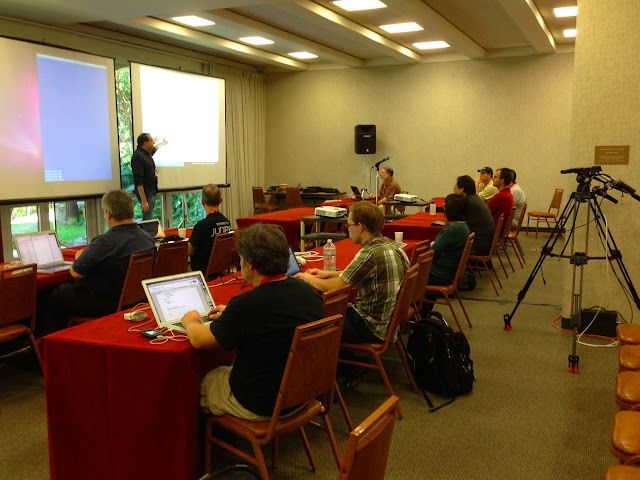 In the evening, back in the hotel, I attended the Internet2 Connector's meeting. This is closed meeting of Internet2 and representatives of Internet2 connector networks (GigaPoPs, RONs etc). I usually represent the MAGPI Gigapop, which is a regional R&E Network run by Penn.